After diagnosis is made of LDA in the bovine, it may be a candidate for repair using the Grymer/Sterner Toggle Suture method, as described in JAVMA - September 1982. 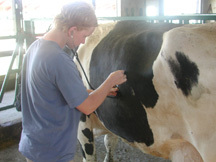 The decision to employ this method of repair should be based upon the facilities and help available, and a careful evaluation of the concurrent medical conditions of the cow. It is advised that the owner/herdperson be consulted as to their assessment of the animal's condition, and as to their preferred method of repair. It is better to fully understand the concerns from both the management and the surgeon's perspective BEFORE an LDA repair is started, rather than to proceed under a wrong assumption.